Metropolis Speedway is the fourth racecourse in Sonic Free Riders. 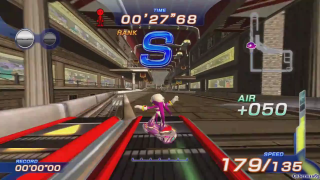 It continues the running theme of the Sonic Riders series' tracks having a futuristic town with floating cars; however, during the level the players enter a darker side of the area, then later into a city bearing a resemblance to Spagonia from Sonic Unleashed. B: Pass at least the first checkpoint. A: Pass at least the second checkpoint. This page was last edited on 5 May 2018, at 14:12.